Organizations seeking to stay ahead of the competition recognize the importance of investing in analytics and visualization tools to deliver insights from their data. They need a modern, powerful business intelligence (BI) platform that will stand up as an industry leader and a vision that will meet the needs of tomorrow. Industry analysts have taken note of our efforts and we are excited to share Gartner has positioned Microsoft as a Leader, for the ninth consecutive year, in the Magic Quadrant for Business Intelligence and Analytics Platforms. 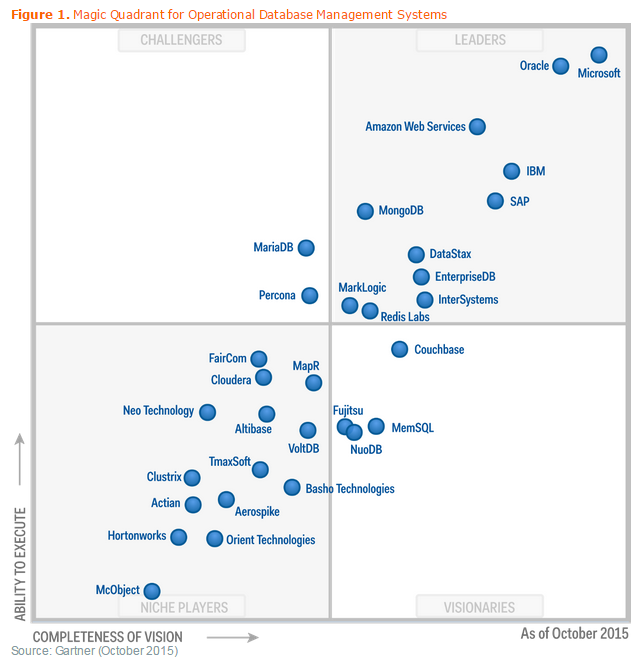 * For the first time, Microsoft is placed furthest in vision within the Leaders quadrant. The establishment of an updated modern BI and analytics platform definition for this year’s Magic Quadrant has significantly transformed the Leaders quadrant relative to is composition in previous years. In a market that is rapidly evolving with new innovation being introduced constantly, leaders in the BI market must demonstrate that they are focused not only on current execution but have a robust roadmap that will solidify its position as a future market leader, protecting the investment of today’s buyers. The strong placement for Microsoft could only have been made possible through the hard work of our many engineers and testers who listened over the years to users of Excel and Power BI to expand the capabilities and drive new benefits. We also must thank the more than 90,000 organizations in 185 countries that are now using Power BI. Just as businesses strive to find an edge against industry foes, Microsoft is determined to deliver modern BI and analytics solutions for all types of users and to remain a leader and visionary in a competitive BI platform environment. Microsoft and Power BI stand out — and the benefits pay off for users. The technologies behind Power BI enable users to create and share insights in real time. With Power BI, anyone can develop rich and compelling stories that perfectly visualize data. And Power BI is continually upgraded by our community of engineers, partners and users, so the tools get better every day. 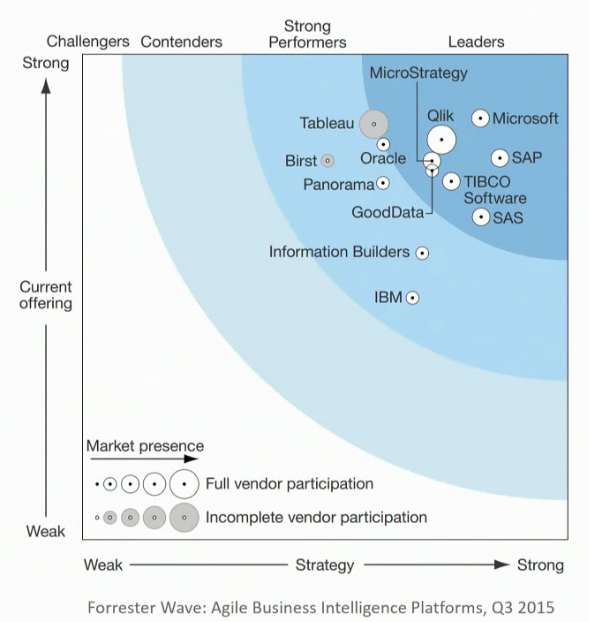 Today Gartner’s Magic Quadrant for Business Intelligence and Analytics Platforms 2015 spread across the internet. The Microsoft BI and analytics product portfolio supports a diverse range of centralized and decentralized BI use cases and analytic needs for its large customer base. Organizations typically deploy SQL Server and SharePoint to support IT-developer-centric data management, reporting and administration requirements, while business-user-oriented, self-service data preparation and analysis needs are delivered by the Power BI components of the portfolio through Excel 2013 and Office 365. Business-user enablement is a clear focus of Microsoft’s product road map and business model evolution — as evidenced by its new “freemium” Power BI product offering (currently in preview), which can be deployed as a stand-alone solution for business users to author and share analytic content without the need for Excel 2013 or an Office 365 subscription. Microsoft’s leadership position in the Magic Quadrant is primarily driven by a strong product vision and future road map, as well as a clear understanding of the market’s desire for a platform that can support systems-of-record requirements and deliver easy-to-use data discovery capabilities, with support for promotability of business-user content and governance. Power BI has gained some traction, but has yet to gain widespread market acceptance due to the complexity of on-premises deployments and the relatively limited functionality currently delivered through the Office 365 cloud; barriers which Microsoft is trying to address with the new Power BI offering currently in preview and due to be released later in 2015. As Power BI matures and cloud adoption grows, Microsoft is positioned to leverage its large customer base (and capitalize on the already pervasive use of Excel and the existing SQL Server Analysis Services footprint in the market) to expand the breadth and depth of its deployments in organizations and increase its overall BI and analytics market share, if it can increase its focus on BI sales and marketing and overcome customers’ structural barriers to adoption. Overall cost of ownership and license cost remain the top reasons customers choose Microsoft (according to the survey). Microsoft has integrated good capabilities into Excel such as Power Query, Power Pivot, Power View and Power Map, which are included with existing enterprise license agreements. Additional cloud-based consumption and collaboration capabilities are currently available in Power BI through a subscription-based pricing model in Office 365. Microsoft recently announced a freemium license model for its new stand-alone Power BI offering, which includes Power BI Designer for content authoring, set to be officially released during 2015 and featuring a free tier for up to 1GB of data storage per user and a Power BI Pro option for up to 10GB available for $10 per user per month (significantly reduced from the Power BI version currently offered through an Office 365 subscription). Many organizations already use Microsoft Excel extensively for data manipulation and presentation of information through spreadsheets, which gives Microsoft a strong foundation on which to build with Power BI and close the gap between it and the data discovery leaders. A key differentiator for Microsoft is its ability to deliver a range of business user capabilities, encompassing self-service data preparation with Power Query and Power Pivot, interactive visualization through Power View and Power Map and the ability to share with SharePoint and Office 365, which few vendors can claim without third-party support and partnership. Platform scalability is a strength of the Microsoft platform, which ranked highest for data volume accessed — with an average data size of 62TB, compared with an overall average of 14.2TB. Microsoft reference organizations also report deployment sizes larger than those of any other vendor in this Magic Quadrant, with an average number of end users of 6,000 compared with an overall average deployment size of 1,554. With the release of the new stand-alone version of Power BI, business users will have access to built-in connectivity to on-premises SQL Server Analysis Services cubes, which will allow organizations to leverage existing data assets without having to move to replicate in the cloud and further unlock the value of existing multidimensional data structures. Microsoft products scored well in its traditional areas of strength: BI administration and development, and integration and collaboration. They also scored highly on business-user data mashup — an area of investment for Microsoft with Power Pivot and Power Query. 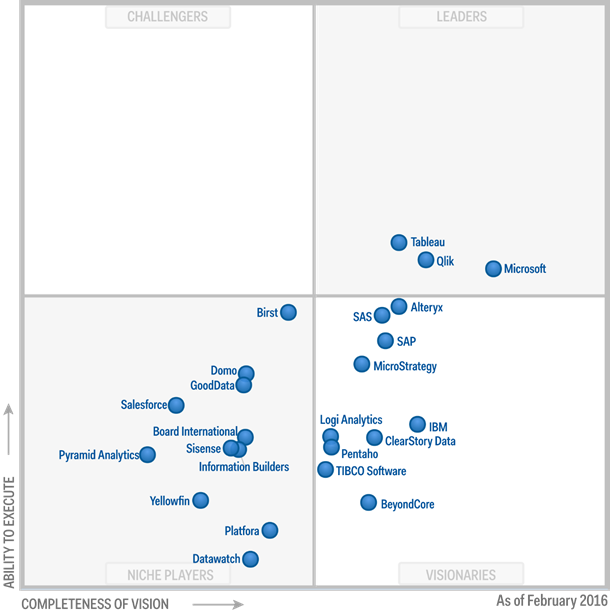 Reorganization and new leadership at Microsoft appears to be positive for Microsoft BI. Since taking over, new CEO Satya Nadella has made support for Apple and Android devices, as well as cloud deployment, a high priority. Microsoft’s product portfolio is complex and includes many components, which can cause confusion for customers evaluating purchase options. 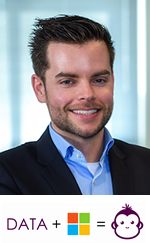 The fact that many of the newer capabilities that are important to buyers in this market require current versions of Office, SQL Server and SharePoint adds to the complexity and represents a barrier to adoption for many organizations that are on older versions and are not yet willing to buy Office 365 and deploy BI and analytics in the cloud. For example, the workflow between components such as Power Query, Power View and Power Pivot is not yet completely seamless. Moreover, the role of SharePoint dashboards and Reporting Services has not been clearly articulated; Reporting Services is not supported in Azure. While it is a work in progress, Microsoft is attempting to address many of these limitations in the forthcoming stand-alone version of Power BI, which does not require Office 2013 or an Office 365 subscription and can access Analysis Services structures and content without physically moving underlying enterprise data to the cloud. Microsoft had the highest percentage of customer references citing absent or weak functionality (for example, no drill-through capabilities in Power View) as a platform problem. This is consistent with last year’s results; and while Microsoft is addressing weakness in mobility, analytic dashboards and free-form interactive exploration with Power BI, market awareness and adoption has been slow to materialize — as shown by minimal client inquiries since its launch in early 2014. Microsoft’s sales model continues to be a pain point for customers, who rated Microsoft fourth lowest for overall sales experience. Customers have historically found it difficult to engage directly with Microsoft during the sales cycle, which was a major complaint from IT but is an even greater concern for Microsoft as it attempts to appeal to business buyers that have high expectations of simplified license models and purchase options. Microsoft has a large network of implementation partners and developers that are skilled in most aspects of traditional centralized BI deployments. However, customers may have difficulty finding external resources with experience in the newer Power BI stack, which requires a different set of skills and expertise than Microsoft’s sweet spot of systems-of-record, developer-focused BI deployments. 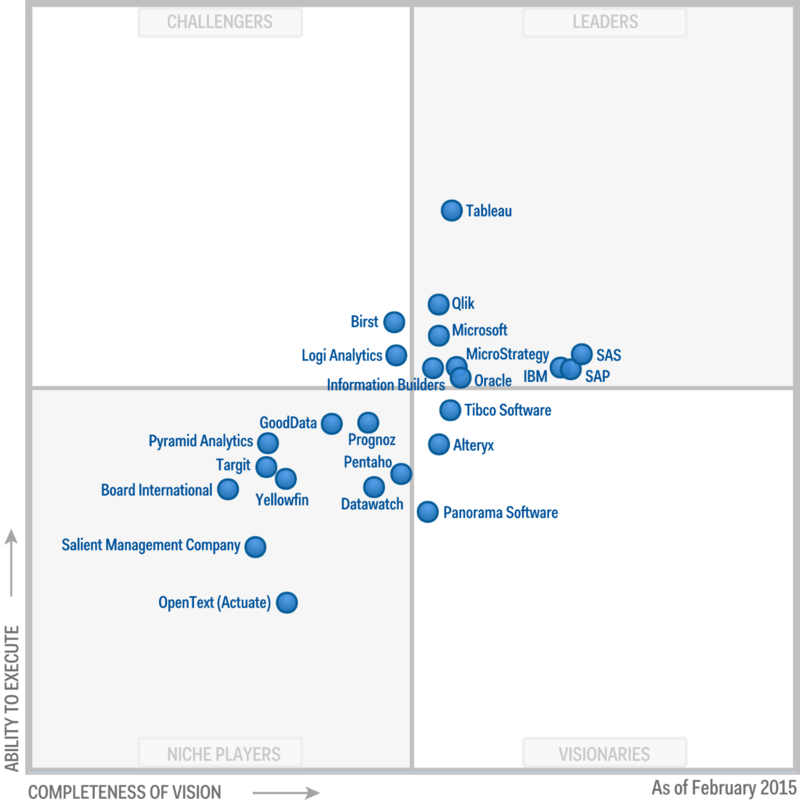 Gartner’s Magic Quadrant for Business Intelligence and Analytics Platforms 2014, click here for the full report by Gartner. 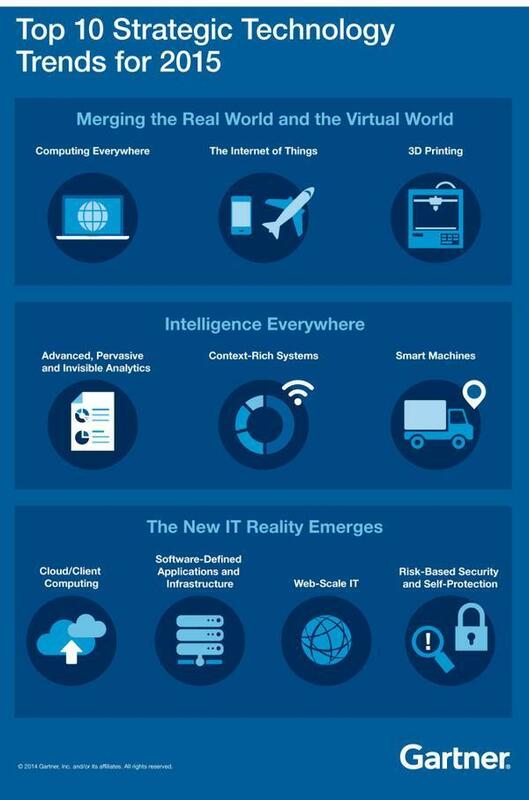 Thank Gartner for the info. Entering 2014, the hype around replacing the data warehouse gives way to the more sensible strategy of augmenting it. New competitors have arisen, leveraging big data and cloud, while traditional vendors have invested — which will force improved execution from new technology companies. For this Magic Quadrant, we define a DBMS as a complete software system that supports and manages a database or databases in some form of storage medium (which can include hard-disk drives, flash memory, and solid-state drives or even RAM). Data warehouse DBMSs are systems that can perform relational data processing and can extended to support new structures and data types, such as XML, text, documents, and access to externally managed file systems. They must support data availability to independent front-end application software, include mechanisms to isolate workload requirements (see Note 2) and control various parameters of end-user access within managed instances of the data. A data warehouse is a solution architecture that may consist of many different technologies in combination (see Note 3). At the core, however, any vendor offering or combination of offerings must exhibit the capability of providing access to the files or tables under management by open access tools. A data warehouse is simply a warehouse of data, not a specific class or type of technology. 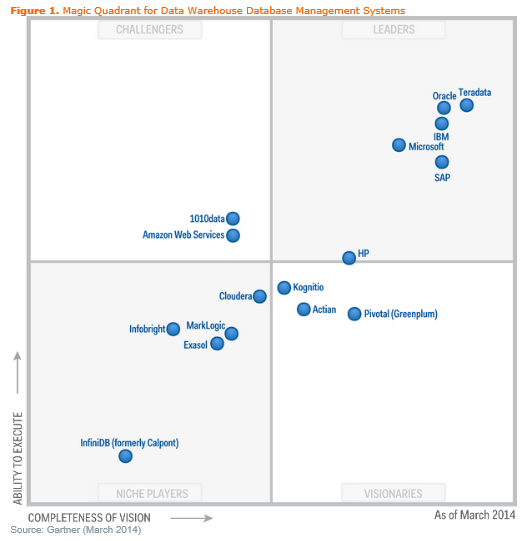 In 2014, this Magic Quadrant introduces non-relational data management systems for the first time. No specific rating advantage is given regarding the type of data store used (for example, DBMS, Hadoop Distributed File System [HDFS]; relational, key-value, document; row, column and so on). All vendors are expected to provide multiple solutions (although one approach is adequate for inclusion), each demonstrating maturity and customer adoption. Also, cloud solutions (such as platform as a service) are considered viable alternatives to on-premises warehouses. A data warehouse DBMS is now expected to coordinate data virtualization strategies, and distributed file and/or processing approaches, to address changes in data management and access requirements. Microsoft (www.microsoft.com) markets SQL Server 2012 (Service Pack 1 has been available since November 2012), a reference architecture and the parallel data warehouse appliance. Microsoft does not report customer or license counts. Gartner estimates Microsoft’s relational DBMS revenue grew 13.6% during 2013 — faster than the overall market. – Microsoft offers appliances, reference architectures including a variety of hardware, prebuilt offerings built to customer selections then delivered ready to run, software licensing and managed services data warehouses. – Customers report a low count of software issues, above-average customer experience and obvious interoperability with Excel (and Office).They also like the easy-to-understand licensing and pricing — adding to execution. – Customers are predominantly on the current release, and almost 60% of customers report it is their data warehouse standard. Microsoft has taken steps in pursuing the LDW with HDInsight (HDP for Windows), PolyBase and Microsoft Cloud (Windows Azure Infrastructure Services can be used to deploy a data warehouse). – Microsoft is catching up with the other leaders, but a fast-follower market demand still drives the Microsoft road map. However, Microsoft has demonstrated its willingness to be aggressive in certain areas (such as unstructured data via SharePoint search and Azure). – Organizations report large volumes of data but, in general, Microsoft data warehouses have a small number of users — better examples of scaling warehouses are needed. Customers want easier access to usable metadata for heterogeneous environments. – Reference customers still report a significant cost advantage, but inquiries indicate that even small price increases do matter and Microsoft needs to maintain its price differentiation from other vendors.